Signing off and toasting: To increasing your health blog traffic to increase your subscribers and clients! This is part 2 of the series Blog Metrics That Matter – Click here to see part 1 where we touched on traffic, comments, and email list growth. Is your blog growing your business? How are you measuring its success? 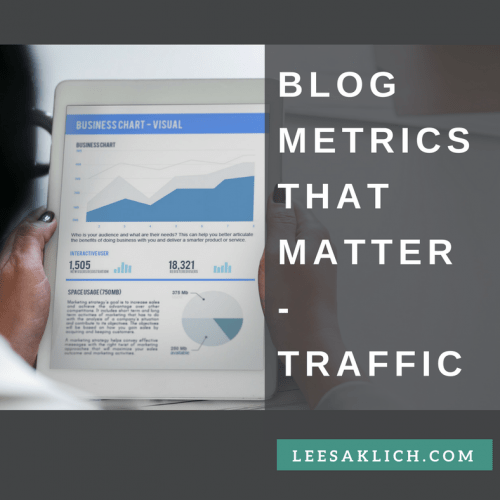 What are the blog metrics that matter? Beyond the basics of traffic, comments, and email list growth we talked about in part 1, in part 2 we’re talking about traffic over time. Content is a long-term game. Your first blog post will not blow up your business. Guaranteed. When you hear about things going “viral” (online of course, not like measles), that’s because of how rare it actually is. People tend to share things that are novel or evoke certain emotions. If you’re blogging to grow your credible health & wellness business, accept that slow and steady will get you where you want to go. The purpose of having consistent, high-quality, niche-specific blog posts is to build your audience, subscribers, and clients. It works to prove to your readers that you’re reliable (consistent), know what you’re talking about (high-quality), and are an expert in YOUR field (niche-specific). Your website is the home that you own to keep your awesome content. Don’t create awesome “pillar” content on social media or elsewhere – you should own your best stuff! Your blog is the foundation for your email newsletter and social media strategies (keep sharing those evergreen blog posts)! It takes time to grow your bank of impressive content for your audience and to consistently share it with the world to find potential clients. In part 1 we talked about traffic. Everyday traffic, and how you should track traffic not just to your overall website, but also for each page and post (to know which ones are more popular). What about traffic over time? Knowing how much traffic you get day-over-day, month-over-month, and year-over-year for your website will show the progress of your blog and website over time. Because the more readers who see your blog, the more potential people you have signing up for your email list, and the more potential clients you have in the long run. give people who already know you a reason to come back for more. Here’s a screenshot of my month-to-month traffic over time using JetPack for WordPress (from Jan 2017-now). You can see a pretty steady increase, with January 2018 being exceptionally big, just because of the giveaway I hosted that month. Check out your blog metrics to see how much your traffic has increased over time. Isn’t this the million dollar question? Second, get in front of more people via SEO (search engine optimization), your email subscribers, social media, pairing up with influencers, etc. Publishing ah-mazing content is an entire blog series on its own. 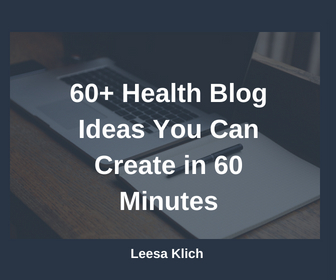 For now, I’ll link you to how to write an article for your health blog as a starting point. Before we dive into how to get in front of more people, have a quick look at how you’re getting in front of people right now. Email (from your newsletter emails that are “tagged” with Google Analytics). Some content marketing experts recommend that you optimize low-performance posts and sources – I say yes, but… also do more of what works! Everyone has unique talents and strengths – it’s way easier to leverage what you love to do and comes naturally, rather than work on building new skills. Plus, online it’s more important to stand out from the noise and crowds because there are millions of blog posts published every day. So rock what’s working for you. Keep that post up-to-date, regularly improving its awesomeness (e.g. the headline, image, keyword research, and yes, the content too, etc.). I added a few more ideas, plus a video and re-published it. Ask for backlinks for the post… the right way. Have an amazing opt-in offer – ideally, if your post is this popular, you should have a content upgrade specific to this post. Optimize the opt-in boxes and copy to use the highest-converting ones (see here for how to A/B test). Throw a promo at the bottom of the post for one of your paid products or services. Keep up-to-date with Google policy and algorithm changes, so you aren’t bumped for something preventable, this goes for your post AND your website. Then, try to replicate your success by figuring out just why it’s resonating so well with your audience! Create more posts like it. Yep! In the online world, you need to keep working just to tread water and stay where you are. Sorry, it’s not the noughies anymore (thanks for expanding my vocab Sarah)! You have an email subscriber list and social media followers, right? Every time you publish another latest and/or greatest post you need to share it far and wide. I mean promote it. A lot. Probably more than you feel you should. Use internal links on your blog, and share it on your social channels and in your newsletter. Maybe even add the link to your email footer. Blog traffic is hard to come by, and you need to get your impressive quality niche-specific content out there to the world. Stand out in the sea of the $3.7 trillion wellness industry. In your newsletter, make sure you’re not only including the valuable information you post on your blog, but also give them a reason to pop over to read the article right on your blog. In my newsletter I usually write a personal note to introduce my readers to my latest blog post, then I have a link to click to read the rest. Let’s accept the online challenge that content is a long-term game, and the wellness industry is growing. Let’s also accept the benefits of consistent, high-quality, niche-specific blog posts, along with a bunch of strategies, and use them to grow your traffic (and subscribers and clients) over time. Where does your traffic come from? Has it been increasing over time? Which of these traffic-increasing strategies will you ramp up for your blog? Have I missed any critical ones? Thanks for the great tips! I’m always telling my clients that content marketing is a long-term game and this article will definitely come in handy in helping convince them. You’re very welcome Alison. I tell my clients the same thing–content is a long-term game. And putting in the effort up-front gives a great long-term result (in terms of becoming known, developing a reputation/brand, and traffic)!